10 Day Green Smoothie Cleanse Review. Can Anyone Complete This Diet? J J Smith created the 10 Day Green Smoothie Cleanse after she had to overcome a serious health problem that lasted for 2 months. Over that period, she experienced weight gain, fatigue, health matters caused by dental issues and it wasn’t until she and a number of people tried this cleanse that it became a very popular and best selling book. The cleanse did help J J overcome her health problems and it did it very quickly (almost 2 weeks). She now shares what she did in her book which I already read. It’s 167 pages long and you will know if this cleanse is perfect for you. You detox for almost 2 weeks. Drink salt water every morning or laxative tea. You cut out any processed foods, carbs. It’s difficult to complete, but it offers tremendous health benefits. My main experience with cleanses has come from one called the Master Cleanse in which for 5 days I didn’t eat anything and drank a special blend of lemon juice. I lost 14 pounds and did feel great benefits, but the weight did come back. The master cleanse wasn’t a plan I’d recommend to everyone, but it did give me respect for cleansing and how great it can be. I’ve done the master cleanse twice and have also done colon cleanses. 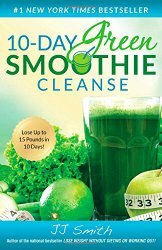 In many ways the 10 Day Green Smoothie works like the master cleanse, except it’s a little bit more flexible because there’s something that you do consume for the 10 days and that’s smoothies, but there’s also an easier version of it provided in the book. How does the 10 Day Green Smoothie Cleanse work? For 10 days, you are going to follow either one plan if you’re aiming for the best results or a more modified plan if you can’t really do cleansing. The optimal plan, called the “full cleanse” is going to have you consuming nothing but smoothies for 10 days. Every smoothie is about 60 oz (3 smoothies) and should be consumed every 3 or 4 hours, or usually when you get hungry. You can drink water (8 glasses a day) or laxative tea and for foods, only a few foods are allowed such as unsalted nuts. You can eat fruits and many of them. J J says you can lose up to 15 pounds in 10 days on this plan. The second version of the cleanse is called the “modified cleanse” where you consume 2 smoothies a day for breakfast and lunch (meal replacement) and for dinner, you can eat 1 meal which can include things like grilled fish. Water and laxative tea is also recommended. The modified cleanse will not provide the same weight loss results as the full cleanse, but it’s an option for people who aren’t mentally prepared to handle the full cleanse. Cleansing itself is not easy and usually people quit very quickly. You are also recommended to do a salt water flush every single morning in which you drink warm water with a tablespoon or two of salt water. You should do this if you don’t have any bowel movements for 24 hours as J J says. The purpose of the cleanse is to keep your body flushing out toxins and waste very often everyday. The more it does this, the more you’ll lose weight and feel better (not at first). Kale, carrots, apples, peaches, bananas, boy choy, celery, cucumbers, beet, mango, blueberries, pineapple, arugula, parsley, spinach, lettuce, turnips and even flax seeds. These are the types of ingredients you’ll be putting into your smoothies. There is a recipe for a different smoothie everyday so you’ll never be drinking the same thing. It’ll change day by day and many smoothies combine both fruits and vegetables. If you need sweeteners, the ingredient stevia is allowed. Solid foods you can eat that aren’t going to be in the smoothie include: Eggs, unsalted nuts and fish and you can also eat fruits and vegetables as well as make salads. Foods and drinks that are not allowed on this cleanse: Alcohol, anything with artificial sugar or white flour, sodas, milk, cheese. Anything that is one the list of allowed stuff is what you should only follow. Can this cleanse benefit diabetics? J J Smith added a separate section for diabetics and it recommends only getting foods from the list provided in the book that have low sugar, but she also says to speak to a doctor first. Cleanses are NOT easy on the average person and they’re probably going to be even harder for diabetics. Please speak to a doctor. Weight loss is really a big part of this cleanse, but diet is really not the right word to use for the 10 Day Green Smoothie Cleanse, because it’s more of a detox and it’s meant for health improvement. Weight loss just goes with this cleanse. Fatigue, irritability, headaches, nausea, skin rashes, muscle aches, cravings. Any sort of cleanse or restriction on the body is going to trigger these side effects. Some of them can be more easily managed, while others are almost impossible to deal with. J J points out that many of the side effects are your body going through serious changes and it’s pointing to it getting better, not worse. Drink more water and try to limit how much fruit you eat so they pass. Usually cleanses and their side effects are felt between the first 2-4 days. Having done cleanses and felt many of the side effects of them, I know that many of them are temporary. It’s the body’s way of crying out that it wants you to keep eating and drinking the bad things that you were used to, but if you don’t let it, it will misbehave, but you will detox it. Your cravings will also change. Very good cleanse to help you lose weight and improve health. A lot of healthy choices for food and detox provided. Can offer great health benefits: more radiant skin, more energy and stamina. This is what cleanses do. Resembles the master cleanse in many ways, except it’s more flexible. Gets the body to change cravings to more healthy choices. Cleanses are not an easy way to improve health. Lots of side effects, which you shouldn’t be scared of, they are normal. The shopping list in the book includes A LOT of frozen fruits. These things are not as healthy. Buy organic only and make your smoothies while they are fresh. I do recommend a different cleanse overall for better results: The Red Tea Detox. 4 stars out of 5. Cleanses can be wonderful ways to improve health and lose weight, but they are never easy to do. The first option is the master cleanse. The only area where it’s more flexible is the total price so if you’re tight on money and you’re ready to cleanse, this cleanse might be better. The second option is the red tea detox. It’s a 7 day cleanse where you drink red tea mixed with weight loss and detoxing ingredients. Then there’s an optional 2 week diet that lets you flow back into a regular eating lifestyle, but it also helps you continue to lose weight and come out of the plan eating healthy and living a good lifestyle. I am so wanting to try on this cleanse, but my worry is, what will happen after 10 days? Can I eat back normal meals? If I take any food wrongly, will my weight bounce? Hi Esther, as I told another person about this who asked the same thing, you should strive to eat healthy after the cleanse to maintain the weight. Of course if you start eating junk food and out of control, the weight will come back. As long as you stick to eating in a healthy way, you should be fine. J.J. Smith has another book (Green Smoothies for Life), You should follow this book after the 10 day Green Smoothie Cleanse. It has healthy recipes in the book. So this is a followup to the cleanse I assume? I’ll take a look, thanks! I’m curious as to how it supports weight loss? If someone is counting calories, and has a set number of carbs, protein, fat and sugar they’re supposed to consume in day, how can the smoothies meet that goal? I know counting calories isn’t always the best way to go about things, but I entered all the ingredients and for what I’m supposed to have in a day-the smoothie didn’t even come close/ went over. I have 14/150 protein, 149/130 carbohydrates, 23/25 fiber, 103/64 sugar(that’s from all the fruit -frozen fruit from hyvee), and 21/50 fat. So is the smoothie actually beneficial? Yeah those numbers seem strange to me too Maranda, especially since it’s telling you to eat so little protein. I would increase the amount of it and decrease the sugar by as much proportionally. But keep in mind, you will still want to keep the sugar at a high rate to maintain energy throughout the day. As for counting calories, this fast is a fast for a reason, as it’s meant to have you consume less than the necessary daily calories so your body starts to burn excess weight inside the body, and that’s where the difference in daily calories will come from. I am on day 4 of the cleanse, about to approach day 5, and I have not lost a pound. Is that normal? You should have lost weight by now, even a little bit, are you following the modified version of the cleanse or the standard, difficult version? Hey, so are we supposed to drink the cup of salt water and then a cup of tea? Or is it either or with a glass of spring water? I’m on day 3 and want to make sure I’m doing it correctly. No, it’s either, or Deja 🙂 normally if you can tolerate salt water, drink that, if not, laxative tea works well too. Hi Vitaliy, Great write up on the benefits of cleanses/detoxes. It’s good that you point out those side effects of doing cleanses – especially for the first time. When our bodies start flushing out stored toxins/waste, it can make us feel “sick” temporarily while all of that toxic stuff is passing through our systems to be eliminated. Green superfoods are awesome stuff and should be a part of everyday diet. Thanks for sharing a great article! Thank you for explaining what I felt today….SICK! I thought maybe I had ingested e-coli on my vegetables but I got them from a really great Supermarket that sprays water on it’s vegetables. I made my first green smoothie today and I only drank one third of it and I was so sick, bloated and gassy and unable to barely eat anything else but drink water until about 6:30 this evening. I’m going to take it slow and just drink my smoothies for breakfast and lunch and eat a regular dinner of low-fat items. My body and its desire to be rid of the toxins actually made me vomit, sweat profusely and I thought I was going to pass out!! I was scared. But I don’t want to quit I’m just going to have to introduce these changes to my body gradually. You may want to switch to the more moderate version of this cleanse then. It seems like you have never done a cleanse of this serious nature and the first attempt was literally a shock on your body. It is actually normal to experience these types of symptoms you are talking about. Some would suggest continuing the cleanse. If you are taking medication, I would actually stop this cleanse and restart with the more moderate one. I’ve encountered this 10 days green smoothie cleanse sometime last year and tried it for only 2 days. But just like you said these cleanses need lots of discipline which I didn’t have at that time. So I dropped it afterwards as the making smoothies part everyday is not something that I enjoy. I just want to ask about cleansing our body. Since usually after a cleanse, we will go back to our normal routine so toxins will accumulate within our body. So do you know what’s the recommended interval between cleanses? Once every few months is fine. Although if you do a cleanse correctly, you will start to crave eating/drinking healthier so that may negate the need to redo a cleanse in the future. Not that I’m against this one Robin, but if other cleanses did well for you, you may just want to repeat them every now and then. What’s the probability we will all gain the weight back even if we eat healthy after the 10 days? Will your body end up being so deprived of food that everything will stick right to you? I don’t think so Troy, I’ve had 2 experiences with cleanses, after I finished the first, I ate pretty healthy for quite a few weeks and the weight did not pack on. It wasn’t until I started diving back into the old, bad eating habits that it happened again. Then the second time I did a cleanse and lost over 10 pounds, it wasn’t long after that, that I began eating badly again. And the pounds did pack on much faster, in a short period of time and it looked as though I never cleansed. So those 2 experiences showed that healthy eating POST cleanse can help you maintain your weight loss results. I am on day 8 of the cleanse..I was losing weight until day 4. Total 4 lbs…then I stalled day 5 and day 6 and on, I am gaining..even though I haven’t changed anything in my cleanse. This is really disappointing. Can anyone tell me why this is happening? Well not everyone who does this cleanse always gets the same results Grace, are you consuming any sugar during the day/night or drinking these smoothies at night? Hang in there. I was also very sceptical. Lost 4 pounds on day 4. Tummy tire is almost flat. Think of this as giving your body what it needs. Cellular nutrition first and weight loss as a side effect. Even if you decide not to do the cleanse, your body will feel better getting nutrients up front. My approach may only work for a small number of people, but treating food as a transaction is not good. Develop a relationship with food, if it only hurts you, drop that food from your list. Besides, you know what a burger tastes like, try something new. I am on my 2nd 10 day green smoothie cleanse in 2 years and I am 51. I completed the first one without cheating and lost 14 pounds without exercising. I did gain the weight back pretty quickly but my energy levels were really high during the cleanse. This really surprised me because prior to the cleanse I had to have caffeine in the morning to get me going, and another when I hit my wall around 3pm. The only side effect I experienced was irritability and headaches on the 2nd & 3rd day. I am on day 4 of my 2nd cleanse and have not experienced the headaches, but I did have irritability on day 2 & 3. I am glad I saw your advise about not exercising because I have been walking/jogging about 3 miles a day and have noticed leg weakness. The cleanse has made me more aware of what I eat, and since getting a vitamix blender, I have incorporated a green smoothie with protein mix into my normal daily breakfast routine & have totally cut out all sodas. Losing weight can be a huge challenge for anyone… however, detoxing obviously can provide some huge benefits if done correctly; not to mention the added bonus of weight loss. Your article is very clear and concise and goes into great detail about cleansing. This cleanse sounds like a great option for a cleansing. And I know when I cleanse (perhaps not often enough) I feel great afterwards. I highly recommend cleansing… having said that, in part to your article I just might explore this one based on your recommendation. Is there any recommendation as far as how often one should cleanse without an immediate need for losing weight? Hi Mark, my grandfather who has tried many different types of cleanses recommends they be done once every few months. I believe before you do it, a doctor should be notified just in case. This diet reminds me of the lemon and cayenne pepper diet except that this one is all green stuff.I use to juice a lot, mainly beets, carrots, celery broccoli, with apples and grapes. I like getting that sweet taste. I don’t know if I can do all green smoothie thought, Now, the salt water flush…hmmm, that’s the part I have a challenge with. The one with the lemon you did was the master cleanse Reneea and I have tried it too. The salt water flush is tough to handle because you run to the bathroom a lot so if you work early, wake up earlier and drink it then so you have time to let the salt water run through. How do you do the salt water flush and what is the purpose? You drink warm water with salt Chiquita in the morning, but don’t do it too often. Do note, a salt water flush has nothing to do with this particular cleanse. I love this article. I’m looking for a good cleanse. I do have questions though. Will this affect any of the medications I’m on and do I have to stop exercising. Is it safe to take if you have a lot of health issues or is it ok for anyone? Cleanses can be dangerous if you have health problems or take many medications Marie, so please ask your doctor. I took the 10 green smoothie challenge in March of this year and I have developed a severe problem with my muscles. I’m having trouble regaining my strength. All of my muscles are very weak. I’m currently going to the doctor to see what I need to do to get better. I’m having difficulty walking, going to the bathroom because I can’t stand without bracing myself to push up. Now I did this with a coworker and she had a little trouble but went too the modified program and had great success. So I’m not telling you what happened to me to discourage anyone but I will say this, if you start to experience any of the side effects STOP and get direction. I I didn’t’ , I was determined to complete the cleanse and I ignored the symptoms of continued weakness throughout the 10 days. The other thing I’d suggest is to know your body first. Even though the ingredients in the cleanse may be healthy it depends on what’s already going on in your body. So get some blood work done first because my vitamin D levels were servery low. It was a 14 and the normal range is 40-100. I’m pretty sure that added to my current condition. In closing if anyone can offer a natural suggestions as to help me expedite my healing I’d truly appreciate it. Hi Michelle, this health issue doesn’t sound like something that a cleanse on it’s own can do, but a condition you may have had before you started and doing something radical like a cleanse might have made it come out. You should keep working with your doctor to find out if there is a specific condition that’s causing all of these problems. Maybe it’s your regular diet, maybe it’s a hereditary condition, but either way, you should not do cleanses if this is how your body reacts to it. Once you and your doctor can find out what is causing the health problems, you can develop a specific diet to fight it. Has anyone else experience blurred vision with the cleanse? I am a diabetic patient and today is my 10th day on the cleanse. I feel fine, my blood sugar number are good and my my blood pressure is excellent, the only thing is that my vision is blurred. Is this one of the side effects? How many calories were you consuming before the cleanse Valorie? Compare it to how many you’re doing on this cleanse because smaller consumption of calories when being diabetic can possibly lead to this problem. I’ve known that I need to do some kind of cleanse for a while now, but have never had the will power to go through with one. This is the first time I’ve heard of this particular cleanse and it sounds intriguing because I do enjoy smoothies. Is black coffee allowed during a cleanse? I don’t know that I could survive in the mornings without it! Hi Emily, you won’t be able to drink coffee. Cleanses are very sensitive to anything you add to your diet, it is better to follow it the way it’s explained. Despite the author providing an option for diabetics, I still believe it’s safer if you discuss this with a doctor Ben. Green smoothie cleanse, I will give this one a try. I enjoy smoothies and a huge fan of kale. I believe an occasional cleanse is very healthy. Thank you for the details and expectations for side effects, pros and cons. Hi Sara, for unhealthy lifestyles, maybe every 3 months. But if you cleanse once, make sure to then eat healthy so you won’t have to do it again. Some good info on here! Have you done this cleanse? what were your results? You see a lot of bad press about this stuff from fitness gurus but i think that something like this can work for REAL people with a family who don’t have tonnes of time doing food prep! Good post bro! This cleanse no, but I have done a different one Kyle and I lost over 10 pounds. Many people in fitness do not approve of these because it is dangerous to mix working out and this type of dieting. Hello! During the modified cleanse can you eat a healthy snack in between smoothies? How much weight is possible to lose on the “modified diet” and with any of your cleansers do you recommend exercising? You can probably eat something but in cleanses, any interruptions to the plan can lead to less results. I don’t recommend exercising when cleansing because your body is already under stress from it. Very cool way to lose weight by shocking the system (your body), and flushing out all that bad food so many of us eat.. I myself started off my weight loss with healthy eating as well. For me, healthy eating became a lifestyle. Maybe you could add a few shake recipes for people look for some particular taste? Very cool stuff. Hi, thanks for showing some options how to rid from unwanted pounds.I know that it is not easy, especially if somebody as me, craves for chocolate. You write about green smoothie here. If I would drink it without other food , I would be mad and unhappy. I am vegetarian, but as you mentioned in your article, I would like to combine together with it more something for my body.Of course, it requires real discipline. You mentioned side effects. They happen, because body rids from toxins. These toxins make us feel weak and irritated. Drinking plenty of filtered water, it fastens toxins removal and we can feel not so hungry. Your green smoothie seems worthy to try and see how it works for me. This sounds pretty extreme, 10 days with no food, not sure that is for me, although the modified cleanse does sound doable, so I might check that one out as I am not looking to lose any weight as such, do a lot of exercise and eat fairly healthy. The side effects do look a bit bleak, but you have provided a very clear and honest review, thanks. It’s extreme, but it’s not the most difficult type of cleanse Rob. There’s a lot of people who get used to cleansing once in awhile and can go through 10 days. This one does allow for drinking smoothies in it’s hardest version and some sort of ease on the modified version. This review on the 10 day green smoothie cleanse is really great because it is unbiased and straight forward information. I like the honesty of it being difficult to finish this cleanse as well as the side effects that one can incur. Knowing what foods are included in the “diet” (I use that word loosely and reference the food, not the act of dieting) is also helpful for people like me who live in a small town and in which many of these foods are not attainable. Thanks for a great review and good luck to anyone who takes on this challenge. Hi! I’ve heard about the cleanse before from people on the job. To me, it seems that you really need to be dedicated to be successful with this. When would be the best time for me to start? I have never done this but I know that I need to do it. Very good question Tina! Dedication is needed with cleanses but the timing needs to fit a period in your life where you have a large window of days available where you can do this. If you’re working full time, you can do the cleanse, but it will make you feel weird and tired. So if it’s your first time, start it on a Wednesday. You’ll have about 5 days to get used to the cleanse, and three of those days will be while you’re on the job. If you feel like you won’t get past 3 days, you can break the cleanse on the weekend, get 2 days to get back and then try it another time. This strategy is good if you’re doing a cleanse for the first time. Everybody reacts differently. Even if you have to stop, you’ll have the experience to try it again later but if you feel like you can go another 5 days, keep going. You’ll finish by Friday and have another 2 days (weekend) to recover after it. You did the master cleanse too….I also lost weight with it but like you said the weight just came back on. I thought what a waste of not eating food for 5 days. This cleanse sounds interesting though….I have a question doing the regular 10 day cleanse and just drinking the smoothies do you find yourself still hungry? Yeah you will have hunger cravings for a couple of days. You will feel better after the third day usually. It’s not really a unique diet Chris. There’s a lot of smoothie diets but for the danger question, if you have never cleansed before you should cleanse for no more than 3 days. Cleanses are hardest for people who have never done them so when the cravings strike and that starts to affect them emotionally, they can do strange things. Cleanse for a few days at first, take a break, then the next time cleanse for a little bit longer. Sounds pretty interesting – cheers for this unique smoothie type diet! I am a little unsure about whether most people can survive ( or even get through ) a green diet smoothie plan for 10 days – sounds a bit extreme. My question is this – is it dangerous to the average joes health in any way?